This topic contains 1,856 replies, has 93 voices, and was last updated by JR19759 3 days ago. 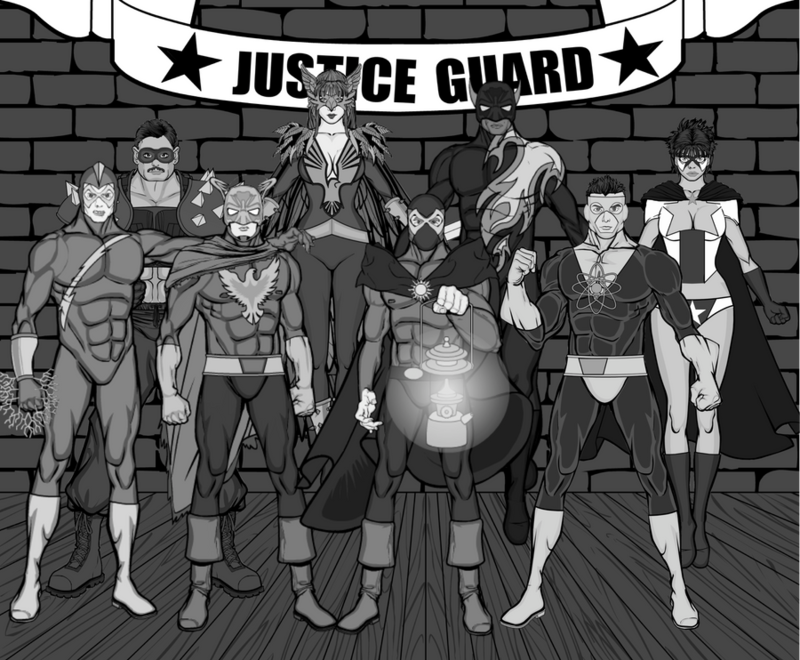 I love the solaria group shot, great job on it. 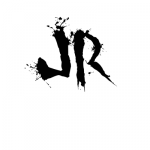 Hey JR, glad your here! You need to get all those characters of yours exposed in these forums. Great stuff! Thanks AMS, I’m going through most of my characters (mostly in group shots, cause I’m good at them) and redoing them with the tips you gave me on shading. Backstory- The year is 2057; the world is now a puppet state for a race of aliens called the Surilins. Watched over by the all seeing eye, the people of earth are forced to mine resources for the Surilins war against the Costrilians. The President, John Dawson, is just a puppet, and his administration silences anyone who speaks out, using vicious Robotic killers (Robohunters) and super powered freaks to police the streets. Anyone with powers are hunted down and terminated, although some (like Mr E and Captain) have started helping the administration track down â€œnon conformersâ€. The old police forces have been dispensed of and replaced by Robohunters. In this bleak world, there is one beacon of hope. 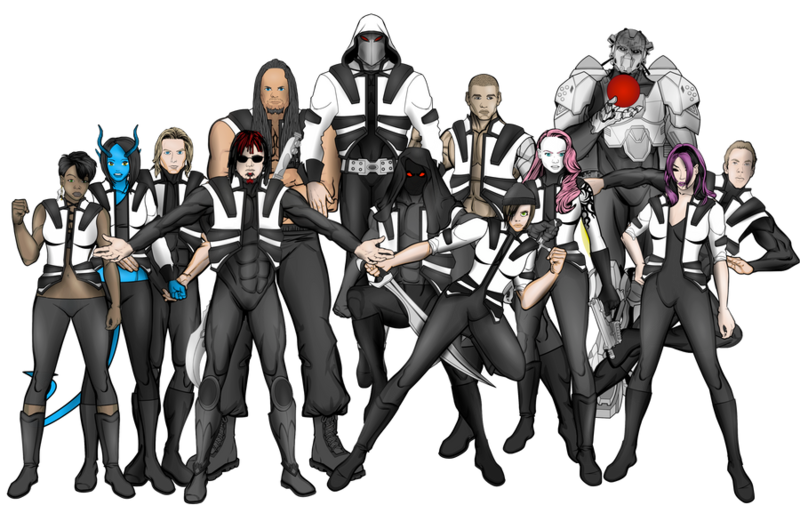 An underground super powered rebel group known as V2. Set up by old superheroes (many of whom have now been terminated) and lead by the son of the Protectorsâ€™ member, The Titan, they fight the administration in any way possible. They lead attacks on administration prison camps, freeing the prisoners. But their time is running short. 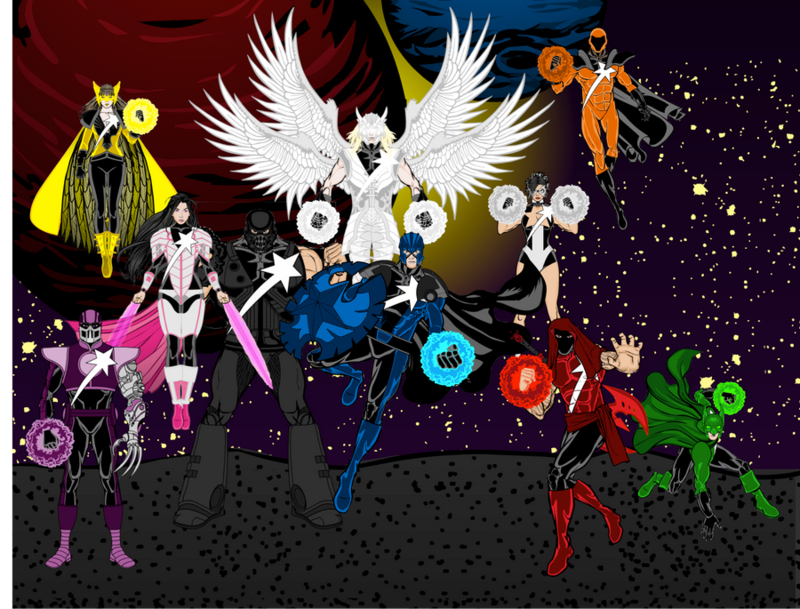 I’ll put up team shots of the original Protectors team and the second one (after I completely redid them) after I’ve done the shading. I read through their profiles, and I’m glad I did. Awesome concepts! Have you written any stories for them? Not yet, I’ve written an outline for a ten arc story, but I’m still struggling through writing another story with 20 parts which is only one arc, so I have no idea how I’d get through it all. Plus I don’t really know if that ten stories is enough for establishing all of the characters and imbuing them with enough depth. man great stuff here!love the group shots and the Protectors look great!I would love to see more! Shade: An infectious sentient cloud that seeks out a host and takes over their body, transforming their physical state and manipulating their mind. Once it has taken a host it can assimilate other hosts into their body, taking physical attributes of the new host into the body, creating a composite host. Woah. Ambitious. Hope you’ll get through it, you’ve got some awesome characters. 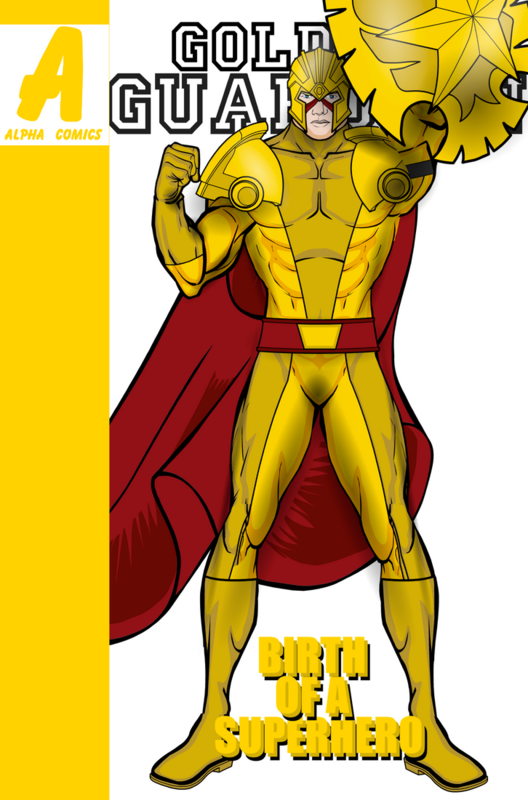 Like many people, when I first heard that The Watchman was putting together a superhero team to operate in the Metro City area, I thought ‘Why?’. Metro City already has The Protectors, and with public interest in lower league heroes waining at this point, many dismissed it as a publicity stunt to try and get the press interested in them again. To the contrary, the battle with Negadroid’s cyborg army proved the doubters very wrong indeed, The Justice Guard works. So when I was invited to catalogue their adventures and the behind the scenes action in the team for the Daily Notice, I leapt at the chance. When I first met the team, I grew to like them immediately. Dynamo is just like you expect him to be if you have ever seen him in action, quick witted, sharp and very funny to be around, the joker of the group. The Watchman, who can come across as surly and uncommunicative in the media, I found to be an essentially warm character, if not as talkative as the others, a man of mystery type they would have said in the old days. 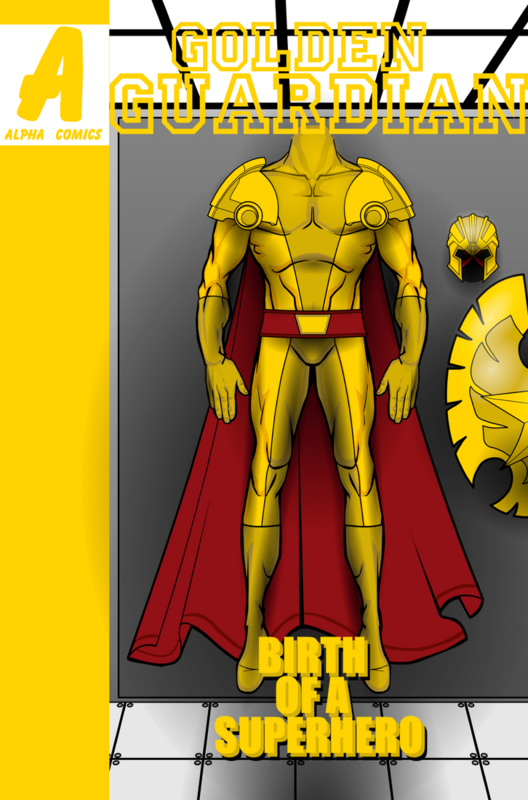 Gold Hawk, currently the only ‘out’ male superhero as far as I am aware, is very calm and measured in his words and actions, courteous and considerate, in contrast to his brash, boisterous sister, Queen Eagle, who had a tendency to trying to make herself centre of attention. Not that she didn’t have her good points. She was very friendly and the most willing to go out of her way to help you, even dropping me off at home when my car was stolen once (hopefully that will be the last time I fly without a plane, I don’t know how they do it). Mr Mass is very intelligent and a good conversationalist, whilst Blackstar was highly charming and very eloquent, with a habit of quoting Shakespeare and numerous political theorists in conversation. Star-Girl, the youngest of the group being barely into her twenties, is much more shy than her former publicist (and father) would have liked you to believe, but she is very polite and pleasant, and stunningly beautiful, even under the mask. However, this leads me inevitably to the black-sheep, the rotten fruit of the bunch, a ‘hero’ by the name of Fix. A hulking brute of a man, he was a ‘superhero’ in the old fashioned sense of the word, a costumed adventurer with super strength who got his kicks from going out a pummelling thugs. I don’t quite know how he ended up in this company, but one suspects he was not invited. This could be plainly seen from his team-mates reactions to his every action, all of which seemed to cause offence, and my numerous interviews with the man, who seemed most eager to talk to me, though I wish he hadn’t. Racist, sexist and homophobic, the man was more like your stereotypical villain than the chisel jawed paragon of virtue that is a superhero. 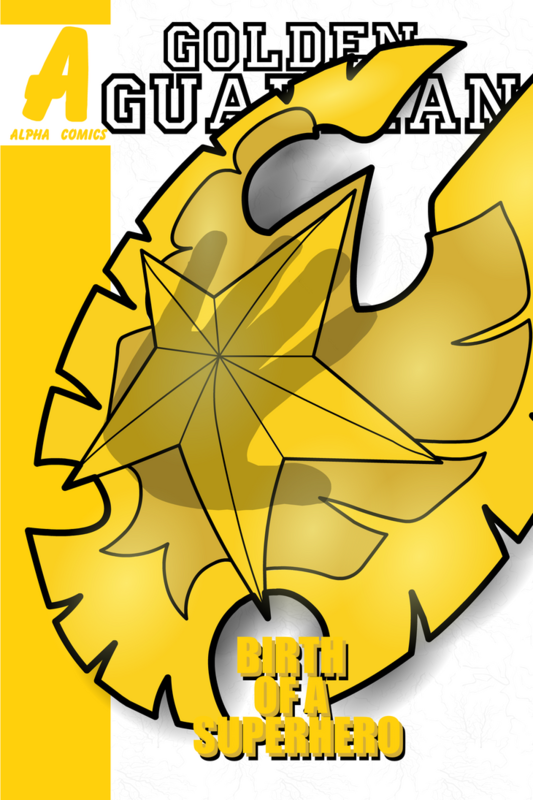 Across the year I followed the team, Fix all but pushed Blackstar (whom he described as a ‘n****r’ and a ‘black S.O.B’) out of the team and could frequently be heard referring to Gold Hawk as a ‘f*g’. There would be huge in-team fights during this time, more often than not with Fix at the centre. Mr Mass would shrink away from such confrontations (often literally), whilst Dynamo would try to act as peacekeeper, often with little success. 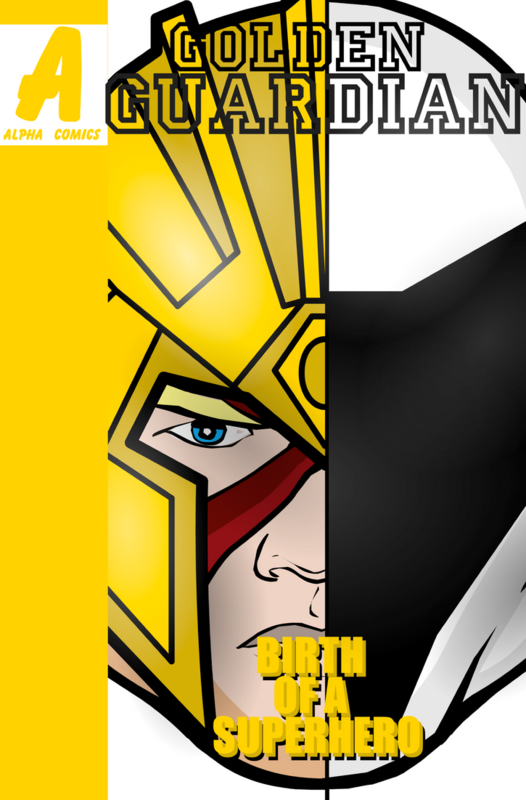 Gold Hawk would try his hardest not to react, no matter how hard Fix would try to antagonise him. But Watchman. Fix knew all of his buttons and pushed all of them frequently. Many times I would enter the lounge at their HQ the next day to discover Mr Mass and Dynamo fixing broken furniture at a molecular level. The only person Fix didn’t ever try to fight with, apart from me thank god, was Queen Eagle. Personally, I think he was secretly scared of her, and who wouldn’t be. She was a formidable fighter and equal to Fix in both physical strength and the ability to dish out verbal abuse. Fix was eventually forcibly ejected from the team by The Watchman about eight months into my time with them, after he was caught making some less than savoury advances upon Star-Girl, a girl at least fifteen years his junior. After that he disappeared. It transpired that not one of his ex-team-mates had ever known his civilian identity, something probably for the best. After Fix’s departure, the team became more cheerful again, reinstating Blackstar and finally bringing to justice The Watchman’s arch-nemisis, NightStalker. However, nearing the end of my tenure, the horizon darkened again. Next: Tragedy Strikes- The countdown to armageddon (Only in tomorrows Daily Notice). Very cool! Love the retro feel! May I ask how you work with so many characters? I tried it once, but went insane. What I do is I make all of the characters and the background separately and save the text, then I put them all back together in a new creation, moving each of the individual items. But If that seems to time consuming, or if I’m working on bits with lots of shading/ there are bits that go off the edge of the screen and aren’t exported, I might export each of the individual parts and put them back together in an external application. It saves a lot of time and you can see how the whole picture fits together and make adjustments without having to go to the widescreen view and then clicking All Items and shuffling the image over until you find the bit you want to change. Hope that helps. Nice set of covers, they blend the artistic with the practical very well. I especially like the first, fourth, and last one.